Playing active games is fun for most children, and it can build a strong sense of community in a classroom. It helps children to be fit and healthy. It can also present opportunities for problem solving and help them begin to meet early learning benchmarks in all learning areas—including math. What is a physically active game? Physically active games involve large motor (muscle) activity and some degree of physical exertion on the part of the players—running, throwing or rolling objects, striking objects, and so on. A physically active game is a social activity—that is, more than one person is needed in order to play it. In many active games, the more people who are playing, the more fun it can be. Like any other type of game, active games have rules. To play a game means to agree to follow that set of rules. Where is the math in physically active games? Math is an integral part of many active games, even if the games are not “about” math. Here are some of the basic math ideas that can be found in many active games. Learning a game involves recognizing and repeating a sequence or pattern of action. First the players do X, then they do Y, then they do Z. Those are “the rules of the game.” To play by those rules, the child duplicates that sequence of actions. Sequence, the order in which things happen, is an aspect of the sense of time. Turn taking, which is essential in many games, also involves recognizing sequences (his turn, then my turn, then her turn). Some sequences in active games are physically necessary to playing the game. For example, if all the players run away before anyone has been named “It,” playing tag will not be possible. If a player releases the bowling ball before the pins are set up, he will have nothing to hit. In any kind of racing game, the sequence in which players finish (first, second, third, last) is central. Other games may require use of specific sequences of words—for example, the ritual “conversations” in Mother May I or in Colored Eggs (see rules below). 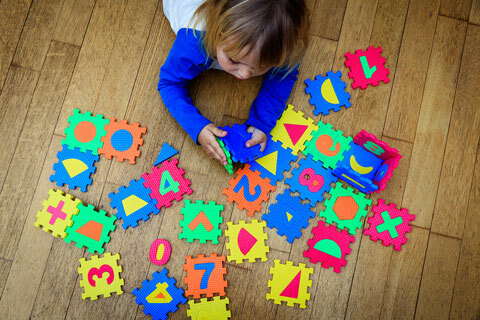 Active games often present opportunities for children to meet Illinois Early Learning and Development math benchmarks related to number and counting. The number of players can be significant during some active games: How many people do we need to play Jumping Beans? How many people are “It” during this game of tag? How many players can fit on our circle during Fox and Geese? How many people are ahead of me in line for a turn? Keeping score involves children’s number sense. In games in which players aim objects at a target, what matters is how many objects actually hit the target. Beanbag toss and ring toss games are examples. Variations on bowling or skittles focus on the number of objects a player knocks over. After a child has gained the physical skills that she needs to play such games, she can get a sense of how accurate her aim is by counting objects that have hit the target or been knocked over. Preparing for some active games may help children lay the groundwork for ordering objects into series or rows. Relays and other races, Follow the Leader, and several other active games require that players form one or more lines in order to play (lines are a kind of row). Preschoolers may already be acutely aware of who is first or last in any line! Getting ready to play bowling games can involve using a traditional bowling setup—a series of progressively longer rows of pins or other objects. When children are playing active games, their play spaces are likely to have boundaries and even specific shapes, such as a rectangular playing field or indoor gym floor. Some games, such as Duck Duck Goose or Fox and Geese use circles as the basis for the playing area. Races tend to involve moving in a straight line. During target games, players are supposed to aim at specific points. In some games, players estimate distances while they play. For example, in tagging games, the person who is “It” needs to consider how fast she needs to run to cover the distance between herself and other players. She may quickly figure out “short cuts,” intuitively using principles of geometry to give herself the advantage when chasing. In aiming games, children learn to coordinate their degree of physical exertion (for example, how hard to throw a beanbag) with the perceived distance to the target. Time-related comparisons such as “faster” and “slower” are key concepts in some active games, especially those that involve racing or catching other players. Children who frequently play active games may become aware of duration (how long a phenomenon—a game or a person’s turn—lasts). A particular game may require “a long time” to play, while others go rather quickly. A group of 5-year-olds may recognize that with recess almost over, they have time for a quick game of tag, for example, but not for a spoon relay. Playing any game involves developing strategies that help the player do what the game requires: “What can I do to get across the finish line quickly?” “I need to get away from the one who is ‘It.’ How can I do that?” “How can I make this ball knock over a bunch of those pins?” The child who plays a game frequently is able to refine the skills and strategies needed for playing and becomes better able to play effectively—running in a straight line, as quickly as possible, across the finish line; dodging, as well as running, to escape being tagged; figuring out where to aim the ball to hit the maximum number of pins. The child’s strategies for playing a game are likely to involve collecting information (very quickly) about objects, spaces, and people around her—including her body’s capabilities and position in space. A player’s strategies may also be linked to data she gathers about what other players are doing. For example, when she is “It” during a game of tag, a child must figure out ways to catch other players who are at the same time figuring out how to avoid getting caught. At any given moment, she may be formulating strategies for catching individuals based on how fast they are running and where they are relative to her position. When children play active games, they often enjoy the peer interaction and the physical activity so much that they focus their strategies on a goal such as having fun for as long as possible. For example, after playing beanbag toss for a while, a group of 4-year-olds may spontaneously move the target so that they can drop beanbags onto it from the playground climber. A few minutes later, they may begin sending beanbags down the slide for other players to catch. They seem less concerned with getting high scores than with continuing to play. This strategy of slightly changing the rules enables them to keep the beanbag play “fresh” and engaging. Adults may assume that active games must involve competition—winning and losing—but a competitive approach is not a necessary part of active games for preschoolers. When people play a game competitively, their success depends on other players’ failures, and they feel fully successful only if they “win.” Their strategies for playing the game often focus on solving the problem of how to “be better than everyone else.” The goal of feeling superior to others, if it carries over into the rest of classroom life, may not align well with the preschool teacher’s efforts to have a cooperative, collaborative classroom atmosphere. Some preschool-age children may not understand or care about winning and losing when they play an active game. Others may not fully understand what those terms mean but still have a sense that to win is “good” and to lose is “bad.” The preschool teacher’s approach to using active games with a class can be a powerful factor in the extent to which the children benefit from playing. Will they see active games as times when they and their classmates worry about being “first” or “best”? Or will they find games to be occasions for learning new skills while enjoying time with their classmates? Helping children focus on math concepts during active games can lay the groundwork for their later, more mature understandings of winning and losing. Preschoolers may know that in a race, the winner is the one who finishes first, or that in basketball, the winners get more baskets than the other team. But in terms of his own development, no child is a “loser” if he has enjoyed playing while gaining new knowledge or practicing skills that will help him in school and in life. What are some ways that teachers can adapt and use physically active games to help preschoolers meet math benchmarks? Some active games are “about” math in obvious ways or are easily adapted to emphasize math understandings, knowledge, and skills. A teacher can try any of several ways of enhancing children’s engagement with the mathematics in active games. This section presents a few general ideas: thinking about math, exploring quantity and number, making predictions, thinking geometrically, and looking across the curriculum. 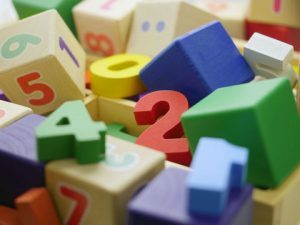 With the teacher’s help, preschoolers can explore quantity and number through a variety of active games. In games that involve tagging or catching others, children can keep track of numbers of people caught or how the game is affected when they make the playing area smaller or larger. During games that involve aiming at a target, the teacher can help the children count such things as how many beanbags get into the basket or how many pins fall each time they roll the ball. The teacher may want to write down the children’s ideas to help them remember their predictions and compare them with what actually happens. Some active games require children to consider lines, shapes, sizes, and other geometric concepts. For example, races are generally run in straight or curved lines, depending on the shape of the “track.” Games that are played within boundaries, such as Colored Eggs or Fox and Geese (see instructions below), call for awareness of shape and size. The relative locations of objects and people are important in many games—for example, beanbags land on, in, or near a target. The teacher can involve children in using geometric thinking in several ways. Children can decide on the shape and measure the length of a racetrack that they will use for a relay; the measurement could be done by pacing (“30 giant steps,” for example) or by using standard measuring tools such as a tape measure or a folding rule. If they are standing in two lines, they can compare the length of the lines or the number of people standing in each. The teacher may have heard some older preschoolers saying that “it’s not fair” to stand very close to the target during beanbag toss. During the next class meeting, the teacher might invite the children to try tossing beanbags from 10 feet, 5 feet, and 1 foot away from the target. The group can make a graph to compare the number of times that they hit a target with a beanbag when standing each of those distances away from the target. Some children may be interested in trying to describe how to play a particular game while the teacher writes their words. They will need to use location words such as close up/far away or behind/in front of, words related to quantity such as all or 3, and words related to comparisons such as more or faster. The teacher might also invite a few children to make drawings of the play space or the play equipment. Doing a long-term project on active games may offer preschoolers additional opportunities to investigate the role of math in games. During the project, the class can gather data about games in a variety of ways. Children can make observational sketches and drawings of equipment used in games, measure the equipment and play spaces, create graphs or tables comparing information about active games, compile the results of survey questions that they ask classmates and family members, and make scale models of game equipment and places where games are played as part of their project work. What are some physically active games that can be adapted to help children meet math benchmarks? Some physically active games are easily adapted to promote players’ mathematical thinking. Tag and other “catching” games, races, aiming games, and parachute games are among the physically active games with variations or adaptations that address math benchmarks. Some of these games, with potential math-oriented adaptations, are described below. Dozens, if not hundreds, of variations exist for the game of tag. Rules can be found in a number of books about children’s games and on the Internet. Here are some teacher-tested math-related adaptations of tagging games. Minute Tag. The teacher or the players can use cones, chalk lines, or string laid out on the ground to create boundary lines for a playing area large enough to accommodate about 10 children who will be running. Players can run anywhere in the area but may not cross the lines. The teacher asks the players, “How many people do you think ‘It’ can tag in 1 minute?” and writes their predictions on a sheet of paper. The teacher sets a timer for a minute and says “Go.” When the timer sounds, play stops so the number of players caught can be counted, recorded, and compared with the initial predictions. 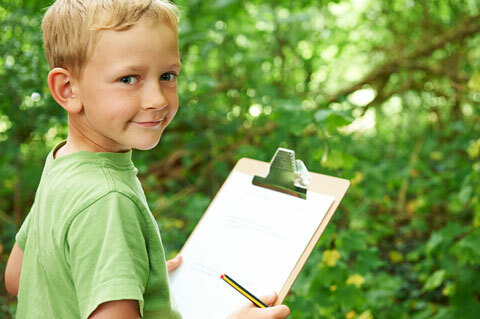 Children can compare their predictions and their results several times. Next time, playing time can be extended to 2 minutes, or the number of taggers can be increased. The teacher can also ask children questions such as, “Do you think that 2 taggers can catch more people in 1 minute than 1 tagger can?” The teacher can record the predictions and the findings after each set. Children can use the data to make comparisons. Fox and Geese. In the snow, the teacher or some players make a circular path at least 10 feet across. They then make two intersecting paths that divide the circle into quarters (like four equal pieces of pie). The “fox” stands at the center of the circle, and the “geese” (two children or more, depending on the size of the circle) arrange themselves on the circle path. At the signal, all begin to move, the fox trying to tag the geese. Geese may not pass each other on the path, and no one may leave the path. Players can decide if there will be a “home” or “safety” spot where one goose at a time may stand and not be tagged. (Sometimes the center of the circle, where the paths intersect, is “safe.” Places where the circle and the other two paths intersect may also be safe.) In either case, a goose standing on a safe spot must leave the spot when another goose approaches and wants it. Players can decide ahead of time what will happen when a goose is tagged. Does she become the only fox and begin chasing geese while the first fox becomes a goose? In that case, the game usually lasts until all are exhausted. Or does a tagged goose join the fox in chasing geese? In that case, the game ends when all are foxes. OR, do geese who are tagged sit on the sidelines and cheer for their fellow geese? In that case, the game ends when all are tagged. The teacher might try inviting the children to vary the numbers of geese in their games, from just one to a whole crowd. They can follow up by discussing whether some quantities of geese seem like too many, or too few, for one fox. For a geometry-related experience, the teacher might involve two children in setting up the circle as follows. Child A and child B stand on a spot in what will be the middle of the circle, each holding one end of a string at least 8 feet long. Child A stands still, holding her end of the string, while child B walks away from her until the string is taut. Child B then walks in a circle around child A, keeping the string taut. (Child A will need to turn in place so that the string does not wind around her.) The result should be a relatively even circle. Another way to encourage geometric thinking with Fox and Geese is to play it several times on circles of different sizes. The class can follow up by discussing what it’s like to play on a small circle compared with playing on a much larger circle. F: What do you want? Everyone holding an egg of that color runs toward the other end of the Barnyard while Sneaky Sneakers tries to tag as many as possible. The Eggs and Sneaky Sneakers must stay inside the Barnyard during the chase. An Egg is safe when he or she crosses the line at the opposite end of the Barnyard. Eggs who are tagged exit the Barnyard immediately. They sit next to the Farmer along the sidelines to watch and cheer for the other players. When Sneaky Sneakers has called and chased all of the eggs, the teacher can ask all of the children to stay in place for a quick count: How many eggs did Sneaky Sneakers catch this time? How many eggs escaped his (or her) clutches? Which group is larger? In another variation, when every Egg has run one time and is either captured or standing at the opposite end of the Barnyard, the Farmer and Sneaky Sneakers go to where the uncaught Eggs are and play continues. This time the Eggs will be running back to the end where they were at the beginning of the game. This switching off continues until all are caught. To address additional math benchmarks, the teacher can change the rules after two rounds of the game so that any tagged Eggs join Sneaky Sneakers in catching the other Eggs. Later, the class can talk about which approach makes the game go more quickly. They may want to experiment with the size or shape of the Barnyard. What might happen if they make the Barnyard longer? Shorter? Wider? More narrow? Do some shapes or sizes make it too easy or too hard to catch Eggs or to avoid being caught? Racing—trying to get somewhere before anyone else does—may be one of humanity’s oldest games. Relay races entail a relatively high degree of cooperation compared with typical races that pit individuals against each other. For that reason, they are especially well suited to preschool classes. A range of relay games are suitable for preschool children, depending on their ages and their experience with running games. It might be best to have children run some straight-line races before attempting a relay so the teacher can be sure that they all understand the principle of running to a specific destination and returning to the starting point. The following suggestions for use with preschoolers can help to deepen the mathematical thinking involved in racing. Down-and-Back Relays. Down-and-back relays involve two or more teams or sides of equal number. Teams stand behind the starting line. The first person in each line holds a ball or other object. At the signal, the first person runs to the “finish line,” sets the object down, and runs back to her line. When she reaches her line, the second person in line runs to the other end, picks up the object, runs back, and hands it to the third person. This sequence is repeated as needed until all have had a chance to run. The teacher can invite the groups to talk about which group finishes first, next, and last. The teacher might also make a point of creating teams that have noticeably different numbers of players to help the children consider the consequences of having one team smaller/larger than the others. Puzzle Relays. A puzzle relay is an indoor variation of the down-and-back relay involving three to seven children, played with the goal of “beating the clock.” Use any floor puzzle that the children are familiar with and that has a few large pieces. On a large piece of paper, outline each piece in its proper place in the puzzle. Put the paper on the floor and mark a starting line on the floor several yards from it. Players line up, each holding a puzzle piece. (The remaining pieces should be in a basket on the floor.) The teacher might decide how much time to allow and then ask, “Do you think you can finish the puzzle in less than X minutes?” Someone sets and starts the timer and says, “Go.” The first player in line runs to the paper, figures out where his or her puzzle piece goes, sets it there, and runs back to his or her line. The next person takes off running with his/her piece. As each player returns, he or she goes to the end of the line and picks up another piece from the basket, continuing until the puzzle is complete. Spoon Relays. A spoon relay calls for different types of coordination from the other relays; children must balance and carry an object in a teaspoon or serving spoon. For older children, carrying a ball (such as a Ping-Pong ball) on the spoon may be appropriate, but younger children will find it less frustrating to use an object that doesn’t blow away, roll, or bounce. Children might need to play this game a few times without the pressure of a “race.” Players form two or three lines of three or more players behind the starting line. At the other end of the relay space are boxes or baskets, one for each team. The objects for them to carry—one for each child—should be in a container on the ground within easy reach of the starting line. At the signal, the first child in each line takes an object from the container and places it on the spoon. Without touching the object again, he walks as fast as he can to the box or basket at the other end, puts the object in it, turns around, runs back to the line, and hands the spoon off to the next person. Aiming games involve taking turns trying to hit an array of items with one object or to hit a single target with several objects. Scores are determined by the number of objects that are struck or the number that land where they are aimed. Other ways to bring math benchmarks into sidewalk bowling include substituting balls that are different sizes or weights or changing the players’ distance from the pins. Pendulum bowling is another variation for two or more players. For suggestions about setting up and playing pendulum games, see Playground Physics: Hang in There! Pins for this game may be block towers, empty plastic water bottles, snack food cans, or other tall cylindrical objects. 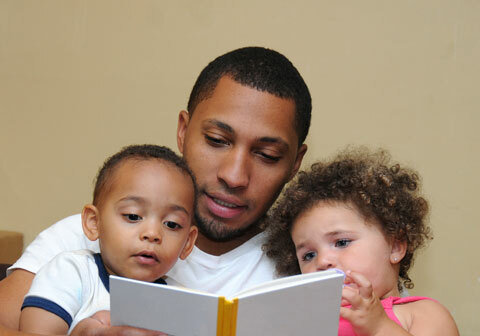 Three is a good number of pins for 2- and 3-year-olds; use 6 to 10 for older children. Players set these items up the same as for sidewalk bowling. Play proceeds the same as for sidewalk bowling except that players must figure out how to aim the pendulum instead of a ball. Target Games. Many variations exist for target games such as beanbag toss, ring toss, and shooting baskets. The teacher can find the rules in books about games and on the Internet. In these games, players usually get points for hitting some part of the target. Scores are cumulative in traditional target games. For example, a child playing ring toss may start out with three rings. She may miss the post the first time but get the next two rings around the post. So she gets 2 points. Sometimes, different parts of the target are given more points than other parts. With most preschoolers, it may be best to have each “success” worth one point. Children can keep their own scores using tally marks. Games involving parachutes or retired bed sheets require children to use their arms and upper bodies. They may be especially well suited for children with mobility issues. The following two games are variations on aiming games, complicated by the facts that several people may be aiming different objects at the same time and that no one can use their hands or arms to aim. Down the Drain. This game requires a parachute or retired sheet with a hole in the center about the size of a small playground ball. Players hold on to the edge of the fabric at about waist level. (Children will soon find that the game is much easier to play with four or more players.) Someone places one or more selected soft objects on the sheet. Someone says, “GO!” Then the players rapidly raise and lower the sheet, trying to make the objects roll and bounce toward the hole so they fall through it and “go down the drain.” Play ends when all objects are on the ground. If an object bounces off rather than going down the drain, someone returns it to the sheet. The teacher can bring a variety of math benchmarks into Down the Drain. The players can count how many bounces it takes to get one or all of the objects through the hole. Older preschoolers may be able to learn how to use a stopwatch to find out how many seconds or minutes it takes to get all of the objects to go down the hole each time. The teacher can also set a timer so children can investigate how many objects they can send down the hole in 30 seconds or 1 minute. Jumping Beans. This game is similar to Down the Drain, but it requires a parachute or sheet with no hole in the center. Players have one of two possible goals: to keep a number of soft objects moving on the cloth for as long as possible or to make all of the objects bounce or roll off the edges as quickly as possible. The teacher can help the group count out loud to see how long it takes to get everything off the parachute (or how long they can keep them all on). A stopwatch is an alternative to counting. The players may want to set the timer for 2 minutes and see if they can empty the cloth in that time. Geometry-related benchmarks may be met by playing either Down the Drain or Jumping Beans with different sizes of sheets or parachutes. Is the task easier or more difficult on a much smaller cloth? A much larger one? 03/2017 Comments Off on Mathematize!